I have been a successful REALTOR® for over 30 years and currently have a real estate license in Arizona and a real estate broker’s license in California. I grew up in Central California in the farming community of Modesto and have lived in San Francisco, Woodside (on the San Francisco peninsula) and Laguna Beach. My background is in construction, real estate investments and interior design. The real estate designations I have earned through advanced study are Graduate Real Estate Institute (GRI) and Accredited Buyers Representative (ABR). As a founding member of the Sedona Luxury Real Estate Professionals (SLREP), I have an ongoing relationship with the top luxury REALTOR® in the Verde Valley. This affiliation ensures that I will have first access to the best properties in the area. My interests are oil painting, travel, spending time with my family and playing with my Shih Tzu puppy, Molly. 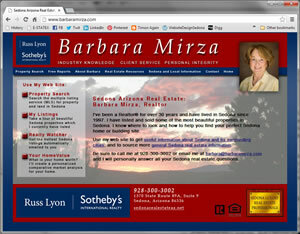 With my experience as a real estate agent, broker, real estate investor and interior designer, I bring a wealth of knowledge to help you discover the richness of Sedona. I’ve traveled and lived in many beautiful places, but I found the most beautiful place of all when I found Sedona.